Blueberry Burst Crunch Bars. Crunchy berry cereal bars filled with blueberries, whole-grain clusters, and crunchy nuts. Life can be hectic, even in the summer. My kids are involved in warmer weather sports and activities. Easy meals and snacks are always welcome. 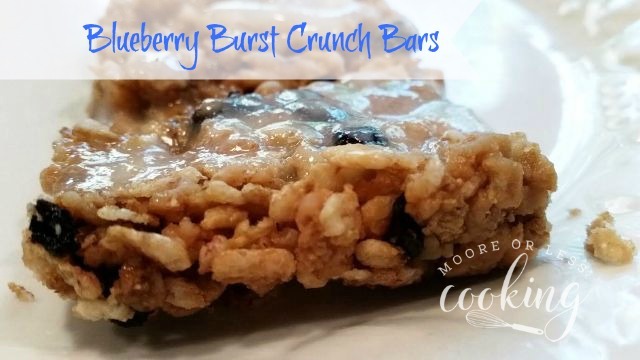 Blueberry Burst Crunch Bars are the perfect grab- it- and- go breakfast or snack choice. These delicious bars have the perfect amount of natural sweetness. It makes me feel good that I can serve my family a snack bar that has a wholesome balance of ingredients that delivers on taste and nutrition. 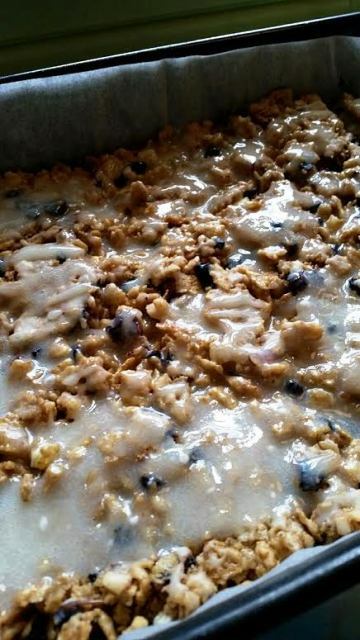 Post Great Grains Blueberry Morning is the key ingredient in these Blueberry Burst Crunch Bars. This wonderful cereal is less processed and it’s good for you! Whole-wheat berry, a tasty mix of grains, nutritious fruit, nuts, and seeds all balanced for a great taste that is irresistible. 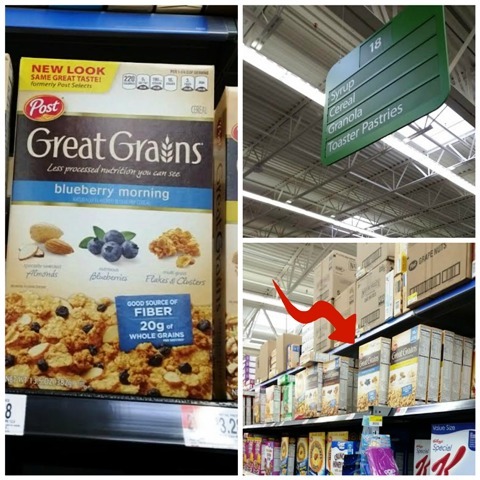 The result is a crispy, delicious, less-processed whole grain cereal that’s high in natural fiber and is non GMO! My kids love blueberry bars and were thrilled with these yummy Blueberry Burst Crunch Bars! 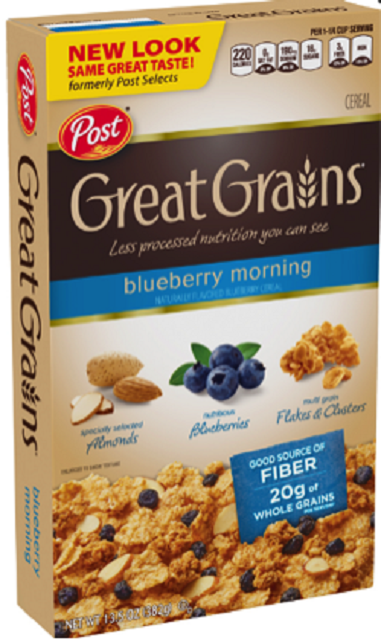 I am excited that I can Buy Post Great Grains Blueberry Morning Cereal at my local WalMart Store. It’s a delicious mix that takes your day from good to great – good things come together to make one great thing. Why Be Good When You Can Be Great? Post Cereal Great Grains Blueberry Morning What you will need to make these delicious bars:Post Great Grains Blueberry Morning Cereal, honey, peanut butter and vanilla, greek yogurt, powdered sugar.If you don’t have dried blueberries, roast 1 cup of fresh or frozen blueberries on a parchment lined baking sheet for 30 minutes. 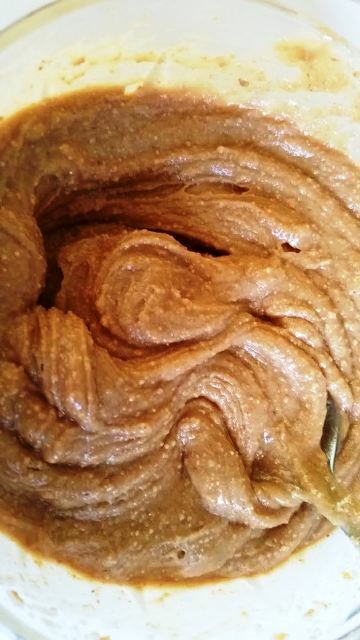 Mix peanut butter and honey together in a microwavable bowl. Heat until mixture is smooth and combined for 30 seconds. Add Vanilla. Add peanut butter mixture to Post Great Grains Blueberry Morning. Add dried blueberries. Stir until combined. 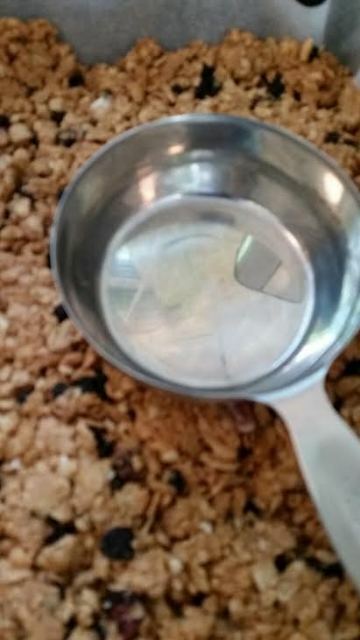 Place cereal mixture on a 9 x 13 baking pan lined with parchment paper. Press mixture with the back of a measuring cup. Place in freezer to set. In a small bowl, whisk yogurt, water, vanilla, honey, gelatin, and powdered sugar. Cut bars into 12 bars. Drizzle Greek Yogurt coating over bars. Let sit overnight uncovered until dry. Grab a bar and enjoy your day! 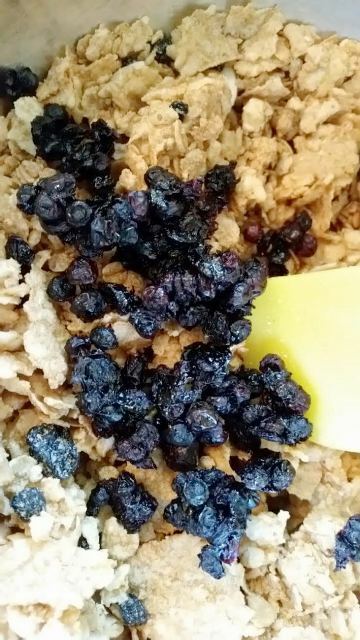 If you are using dried blueberries, skip this step:. 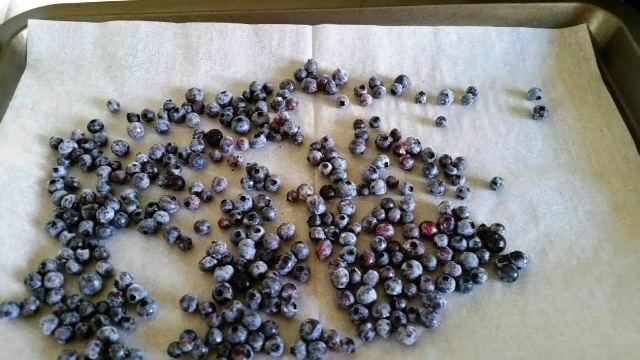 Preheat oven to 350 degrees F.
Line a baking sheet with parchment paper and spread the blueberries on the baking sheet. Roast for 30 minutes, or until the berries burst and shrink. Line a 9x13 with parchment paper. In a small microwave safe bowl combine the peanut butter and honey. Microwave for 30 seconds to 1 minute or until the mixture is hot and pourable. Add the vanilla and mix again.Add the honey mixture to the cereal and mix until everything is moist and combined. Gently stir in the blueberries. Press the mixture into the prepared pan and then using the back of a measuring cup press the mixture into the pan until it is tightly packed. Cover and place in the freezer for 1 hour. Cut into 9-12 bars and return to the freezer. Make the greek yogurt coating. Combine water and vanilla in a small bowl. Sprinkle the gelatin over top and whisk with a fork until the gelatin is evenly distributed. Set aside for about 5 minutes or until needed. It will set into a thick paste. 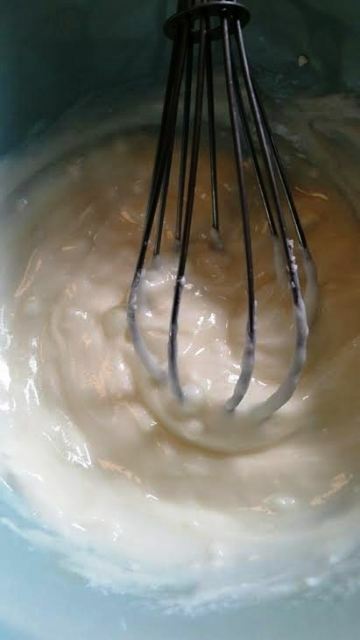 In another small bowl, whisk together the yogurt, honey, and salt. Microwave on 15-second bursts, stirring in between each burst, until the yogurt is liquidy and very warm to the touch. Don't boil or the yogurt will curdle. Microwave for 30 seconds total. Whisk the gelatin into the warm yogurt mixture. Whisk until the gelatin is completely dissolved. Scrape the yogurt mixture into a medium mixing bowl. Pour the powdered sugar on top. Use a mixer or whisk until the yogurt and powdered sugar combine into a thick, but pourable, coating. Drizzle yogurt coating over bars. They will be very sticky. Let the bars sit, uncovered, until dry to the touch, about four hours or overnight .Once the bars are completely dry, store in an airtight container at room temperature. What’s your favorite go-to snack when you have a busy day? Love this healthy snack full of antioxidants! These would make a great on the go breakfast Nettie! All my favorite bar ingredients wrapped up in one! Yum! These will be great to grab in the morning on the way out the door. 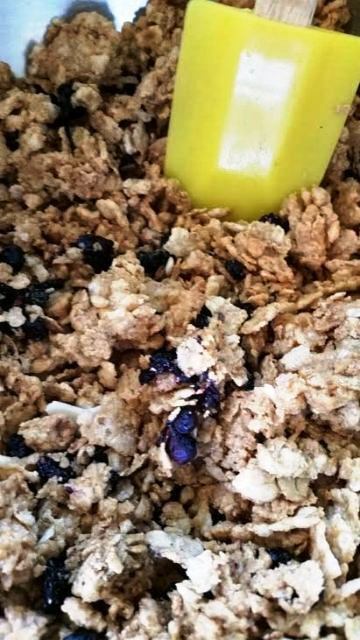 I love blueberry anything and crunch bars sound amazing to make. We’re going away for the weekend so I’ll def make some to go. Thanks so much for sharign this!